Raúl David Serra Costa, CT1BBR, was member founder(#002) from CS1CRA Clube Rádios do Atlântico ( CT Lighthouse Radio Club) during many years he dedicated most of the time as a Secretary Treasure he was also President . Raúl was a great CW enthusiast and teacher and Old Timer operator . With license in Portugal since 1976 he operatiung most of the time in CW . Raúl Costa was one of the CW operatores at many activities from the Radio Clube CS1CRA specialy on Lightouse. Raúl Costa s of IOTA for Portugal specialy in Azores Archipelago and Madeira . Finally IOTA committe agreed , and Azores as a New reference Iota. 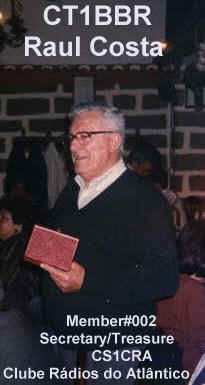 Mário dos Santos Miranda DJØMW also with license in Portugal CT1DNP, was living in Germany over past 40 years, married with Helga . DXpeditinionary and entusiast for DX and Contest. Usually it was easy to find him operating or from Madeira Island or from Center of Portugal, or Algarve in south of Portugal. Every year during first week he was responsible for some DX spots on cluster from na operation from any Portuguese Island, Ligththouse or Castle or fortress usually himself with Marq,CT1BWW they work as a team . Remenber CTØB, CQ7B, CQ1B, CQ8I, CS2V, CT7B, CQ6C, CS5M, CT6C, CQ7Q and many others DXpeditions??? Mário was so envolved on Dxpeditions that he was always preparing a NEW ONE for everybody ! As you remember many of Portuguese Islands were first time on the Air with Mario and his friends ,ex. N.S.do Rosário, Cacela da Abóbora, Pedra do Pata. Also operating from Lighthouses on 1st time, like CS1V (Cape S.Vicente Lighthouse) (Insua Lighthouse) (V.Real St.António)and Castles or Fortress too like S.João Baptista Fortress, Castro Marim Castle, Alcoutim, Rato Fortress and many others. Mário during for many years working "hard" for "New" references of IOTA for Portugal specialy in Azores Archipelago and Madeira . Finally IOTA committe agreed , and Azores as a New reference Iota. MARQ (CT1BWW) HAS THE LOGS AND CAN CONFIRM QSO'S FOR FOLLOWING ACTIVIES: CTØB, CQ7B, CQ1B, CQ8I, CS2V, CT7B, CQ6C, CS5M, CT6C, CQ7Q.